Baal HaSulam, “A Speech for the Completion of The Zohar“: At that time you will achieve equivalence of form with the Creator—as all His actions are to bestow and to benefit others, so you, all your actions will be only to bestow and to benefit others. This is the complete Dvekut. Question: What is equivalence of form? How can I be equal in form if I am a desire to receive? Answer: Suppose you want to resemble me. I play with you, I present myself to you in some form, and then you try to be like me: You do what I do, think like me and talk like me. The next day I present to you an upgraded form and you have to adapt yourself to me even more, both in your speech and in your actions and thoughts. I give you examples and you have to follow them; this is called an equivalence of form. Ask. Ask the Creator to give you an example, to show you who He is and what He is, so that you could be like Him. If you don’t ask, it means that you don’t want to be like Him. When all you really need is an example, you will receive it. Question: I have a cat, I can teach it everything that I know, but will it eventually be like me? Answer: A cat doesn’t have a point in the heart. You cannot teach it, you can only tame it. 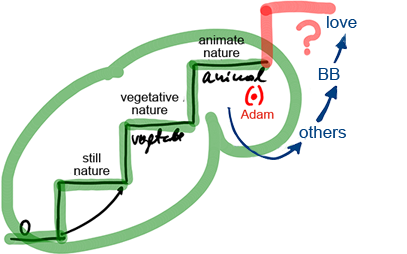 You can make something out of it, but you cannot make a human being out of it, since a human being, Adam, means “Domeh – similar” to the Creator. A cat doesn’t have the starting point for that, it doesn’t have the initial spark; it doesn’t have a point in the heart. If it weren’t for the point in the heart that entered the desire to receive during the shattering of the vessels, then we too would develop up to the level of the animate. But when we complete this phase, the point of the speaking level erupts in us. This is what is happening today to humanity: It has reached the end of its development on the “animate” level. Everything began from scratch, from chaos. 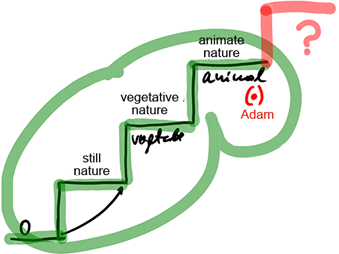 Then the level of the still nature appeared, then the level of the vegetative, and then the level of the animate. If there weren’t the point of the speaking in the animate level, the human being that belongs to the level of the speaking, then there would be nowhere to develop to, everything would end here. This is the surprise and problem in our world: People don’t understand that they are facing a new level. They don’t understand because they don’t see it; it isn’t tangible, it is spiritual. All the previous levels were concrete, while the level of the speaking is not. If I am on the level of still nature, I cannot identify levels that are higher than mine: the vegetative and the animate levels. There is a connection between them that is visible both to the lower and the upper, but I have no idea what the human level is, and to rise to it is a big mystery for me. What can I do, if I have no way to hold on to it, no examples, but only one great unknown? This is the reason that the whole world doesn’t understand what is going on and cannot accept the message of the future ascent. Initially, the desire created by the Creator was the part that serves as the point in the heart (•), Galgalta ve Eynaim (GE). This is called “Israel” which means “Yashar-El” (straight to the Creator). Abraham took the people who belong to this part out of ancient Babel, while the other Babylonians without a point in the heart remained. 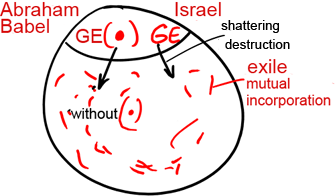 Then by the shattering, the destruction, the points of Israel fell and were mixed with the matter of the desire. This is the exile of the people of Israel, the mutual incorporation of the attributes resulting in every person having a point in the heart today. Still, it is very hard for people to see that there is another phase in their development before them, another level that is of a higher quality and is more essential and powerful than the “animate” level. Imagine that you could only see plants on the surface of the earth. How different would this picture be from the next level, with the animals, birds, fish, and people with their civilization. Now, when we are facing a new level, no one understands it and no one can perceive the need to rise to it. Question: If the point in the heart determines everything, can I be compared to Pinocchio today? The next level cannot be formed from nothing. So the people who feel a need to develop come to us, to Bnei Baruch, in order to advance by love, with an inclination upward. Others will have to develop by the path of suffering in order to reach this level. If the point in the heart doesn’t stand out and doesn’t remind people that it exists, only sufferings will push them forward. 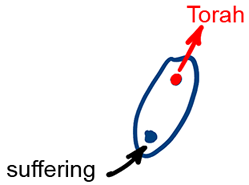 The point draws people forward while the sufferings push them from behind. It is like a dipole and everything depends on what moves you—whether it is Torah or suffering. The internal work begins when a person feels that in every situation and place, no matter what he finds himself in with his desires and his thoughts, there is an awakening from Above, and he has to add his response to this upper action. First he wants to differentiate himself from what he feels and to try to find out what it is exactly that the Creator sends him, why, and for what reason; what does He want to build in a person with that? He needs to clarify what is happening inside him in order to differentiate his natural response from the one that he has to develop inside above that natural one. The response that a person builds above his nature is composed by his participation in the events and the other half, he is forced to raise to the Creator, knowing that he cannot do it by himself. But he is glad that he discovers the part in which he needs the Creator’s participation, feeling the Creator as a partner, as the eminent, and as his savior inside him! In this case, a person sees a clear goal before him, understanding that he must reach connection. This means that the first awakening that comes from the Creator in a person’s mind and heart reaches the right implementation. The sign that it is implemented correctly is a person’s change of attitude to the opposite of what it was before, and the great joy he feels about it, which means a successful attempt to rise above himself. And all of this progress is due to the upper force that now remains in a person. Every action that we make in every moment is fulfilled that way if it’s received correctly in a person. Question: How can I examine every action that I make more effectively in order to discover the reason for the awakening from Above that caused it? Answer: Let me give you an example. Suppose the phone suddenly rings and an unfamiliar voice says, “Wait, I am coming to settle my account with you today,” and hangs up just like in horror movies. You don’t know who has just called and what it’s all about! You begin to look at everyone that you meet suspiciously and fearfully. You check and examine everything that happens. This is exactly how we should look for the Creator. We need the concern, the anxiety, the fear, the insecurity, and the helplessness that force a person to remain sensitive and alert and to check everything that comes his way. If the goal is very important to me, but I don’t see that I advance towards it, I worry about what is happening and have to find out what is standing in my way. What is the goal exactly and maybe I am not imagining it correctly. What are the means for attaining it? Here I discover that my problem is that I simply have to turn my hatred into love. I have to check my state and my intention and to concede where I currently cannot concede. I have to pay attention to what I disrespect and consider as unimportant now and to try to feel it. Then I will regain consciousness and suddenly see the upper world. I don’t see it now only because I don’t want to see it! It all depends on changing one’s principles according to which a person relates to reality. They determine what a person’s reality will be like. Question: What exactly goes into the 1% of the desires that a person cannot process by himself when he is under the Machsom (barrier)? Is it the stoney heart, the serpent? Answer: We don’t examine such discernments before the Machsom, before the spiritual barrier. Before it, we don’t see anything and have no understanding or recognition as to where the serpent is and where it isn’t. Believe me, it is in your best and purest thoughts and desires, where you think that you love and devotedly care about others, that the serpent is. Just like in history, at the time of the exile in Egypt, the serpent is not revealed among common people, neither the Jews nor the Egyptians. Only Moses, Pharaoh, the Creator, and several Egyptian priests, Pharaoh’s counselors, and those who were close to him saw the serpent. It is only among them that the serpent is revealed and becomes a staff, and then the staff becomes a serpent again; it is only when a person attains such high levels. The serpent doesn’t appear purposelessly, but only as tiny snakes on the animate level. The real serpent, however, is two-legged, and you have not met it yet. It is only on the upper levels that the essence of the snake is revealed. A very strong Light is needed to show us how opposite our desire to receive is from the Light. The Light has to reveal its full infinite depth and the power of its love and bestowal so that in contrast to all that, we will feel how opposite our egoistic nature is from it. The real two-legged serpent is revealed only after the Machsom. Until then, during the time of preparation, only small snakes bite us. Each time something disturbs you and repels you from connecting with the friends, from unity, from cooperation, from the right intention—this is the revelation of the small siblings of that serpent, and they eat you up like worms. “Princeton University researchers report in the journal Science that collective intelligence is vital to certain animals’ ability to evaluate and respond to their environment. Conducted on fish, the research demonstrated that small groups and individuals become disoriented in complex, changing environments. However, as group size is increased, the fish suddenly became highly responsive to their surroundings. “With their work, Couzin and his coauthors uncovered an additional layer to understanding collective intelligence. The conventional view assumes that individual group members have some level of knowledge albeit incomplete. Yet the Princeton researchers found that in some cases individuals have no ability to estimate how a problem needs to be solved, while the group as a whole can find a solution through their social interactions. Moreover, they found that the more numerous the neighbors, the richer the individual — and thus group — knowledge is. “This finding … relies on the illusion that what happens in virtual reality is real. Participants viewed the world through a head-mounted display, a helmet that provides three-dimensional stereoscopic views of a high-resolution rendered environment. An orientation sensor on the helmet tracked participants’ physical head movements and updated their rendered first-person perspective. To enhance the seeming reality of the experience, virtual sound was added to match the movement of objects and the vibration associated with action. My Comment: Following your dream, you need to understand how to make it come true in reality. If the dream is correct, that is, it coincides with the reality according to the plan of Nature, then from that future reality already existing in the virtual world, you can attract a force that realizes the dream; this force is called the Surrounding Light (Ohr Makif). “The biggest need is perhaps foresight. Ministers often need instant answers, and sometimes the data are simply not available. Bang goes any hope of evidence-based policy. My Comment: Of course, all these are excuses because politics is not rational decision-making, but promoting one’s narrow egoistic goals. Scientific methods of data processing and decision making lead to no good because human egoism is at the end of this process, and it will do anything to tilt decisions in its favor. Thus, before making objective decisions, you must make an objective person. Question: In the process of integral education, do we need to disclose that we do not know exactly what the future society will be like? Answer: We simply implement integral education and in accordance with this we will see how best to gradually change the world to match our new states. This is the world that we cannot even foresee so in no way should we get ahead of ourselves. The fact is that we have always evolved linearly under the pressure of our egoism and that is why we could predict the next images, states, and plans for the future, but here not. The plan for building an integral society is only in the organization of our self-improvement more than anything. And all the rest originates from it. That is why we have no long-term plan; it depends on a person, the pace of his change. From the moment we accept this idea, it becomes very simple. That is, I should not force myself to fit in some future framework. I will reach the framework that I want to reach. We are already becoming integral, free. The main thing for us is to be engaged in unity, mutual guarantee, and nothing else. From this follows the rest.